Menu Creator - You can create 5 VB menu styles: Button3D, Office 97/2000, XP,2003 and New3D! Add to menus: images, descriptions, colors, backgrounds, gradients side-bars for each popup menu with aligned/rotated/colored text, image, custom colors, and more! 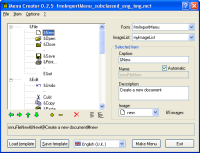 You can create, import and save yours menu easy! - 5 menu styles: Button 3D, Office 97-2000, XP, 2003 e NEW3D. Note that all menu style is customizable! The final touch is give by the Menu Designer (MenuExtended)! While you run your program, you can open the Menu Designer where you can set ALL properties easy, simply with click. You don't need to write code, with Menu Creator, Menu Extended & Menu Designer you can transform your application and give, to end user, programs with a fantastic look! Ghost Control - Record the repetitive tasks that you do, and have your computer do it for you. Kids Coloring Book - Virtual Kids Coloring Book with over 5,000 pictures in the FULL VERSION! Raster to Vector - Convert scanned drawings and raster images to HPGL, DXF, WMF, and EMF vector. Rainbow Drops Buster Deluxe - Challenge your skills in five different game modes with bonuses, tricks, etc. Test your skills in timed modes or challenge yourself in tactical or strategic modes. StudioLine Photo - An affordable software package that allows you to manage, edit, and share your digital images all in one application. Glucose Journal and Database - Helps user keep an organized journal of important blood glucose test results.